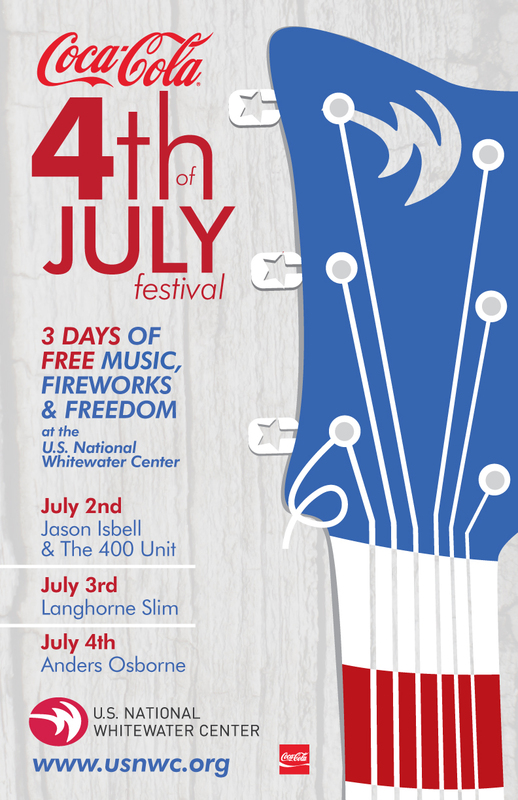 I’ve heard about the big 4th of July festival at the Whitewater Center each year, but I’ve never actually attended… This year will be the first, I suspect, judging from the great time that I had at the Memorial Day Celebration. Considering the information the USNWC is posting about the 4th of July weekend, I’m pretty excited already. The Coca-Cola 4th of July Festival is the biggest event of the year with 3 consecutive days of free live music and fireworks. The weekend-long celebration will begin on Saturday, July 2 and conclude on Monday, July 4. Just like our other music festivals, we’ll be jamming from the big stage on Belmont Abbey Island. With music beginning at 4 p.m. each day, you’ll be hard pressed to find a better free music lineup. Saturday’s show will feature the blue-eyed soul of Jason Isbell and the 400 Unit, along with openers Riley Etheridge, Jr. and Do It To Julia. On Sunday, we will play host to the Americana rock of Langhorne Slim, the Overmountain Men and Holy Ghost Tent Revival. We’ll close out the weekend on Monday, with the blues-rock of Anders Osborne, The New Familiars and Sol Driven Train. The party will continue each night with a fireworks show. We’ll launch the fireworks from Hawk Island and the show will display over our whitewater river. If you have ever seen fireworks at the USNWC, you know that there is not a bad seat in the house. We recommend you come early so you can enjoy the festival atmosphere all day long. Whether you come early for a trip on the new Canopy Tour, or simply just to relax by the river, there is no better place to celebrate Independence Day weekend than at the USNWC. So, my usual question to my GatorUptown.com readers… Who’s coming with me? This entry was posted on Thursday, June 9th, 2011 at 6:08 pm and is filed under USNWC. You can follow any responses to this entry through the RSS 2.0 feed. You can leave a response, or trackback from your own site.